This is now the second edition from Steve Longland and one of the most popular books for beginners. Many clubs use it to cross reference training record lessons to the relevant sections of the book. This is a really excellent book. Its key strengths are simplicity and clarity - on these it is arguably the best book for the absolute beginner to gliding. The diagrams are simple and clear but very useful - for example the diagram on 'lookout' is etched on my brain! 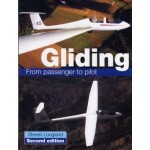 In the end I got 3 beginner gliding books - this one, Piggot and Stewart. They all do certain things very well and do complement each other. But for those first few weeks I'd say that Longland is the best - giving a crystal clear introduction to this fantastic sport. As well as the basics of flying a glider, other very useful aspects relate to the history of the sport and an outline of how a gliding club functions - these were very useful indeed as gliding clubs are often set up very differently to powered flying clubs. A fantastic book and worth every penny!